Let's get this clear, I know next to nothing about electricity or cars. The combination of the two finds me lost in a sea of amps, volts and burning rubber. But I love the concept of directly driving a wheel with an electric current, and riding that wheel into the sunset. Putting the Parts together: To see those wheels spinning at over a hundred miles an hour was too good to pass up. I originally heard about Electric Car Racing in a Wired article a couple years back. John Wayland was one of the featured interviewees, and he just happens to live here in the Portland area. I had kept an eye out for upcoming events like this. I found out what I was doing this weekend through the Oregon Electric Vehicle Association's website. 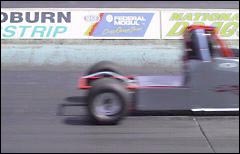 Getting to the Starting Line: An official National Electric Drag Racing Association event was held just down Interstate 5 at the Woodburn Dragstrip. I trundled down there in Viva and spent the larger part of the day out in the sun, watching all sorts of electric and non-electric vehicles taking turns are the drag strip and the autocross. Clean Racing: There were some great racing machines there to take on the competition. An electric dragster took to the track and had a run of nearly 110 miles an hour! Also pulling up to the starting line was a real crotch-rocket motorcycle that flew. I can only imagine that it's the same feeling that Superman gets when he's in the jet stream. There was even a pocket-cycle: a motor cycle no more than 2 feet tall, three feet long. It looked more like a clown's motorbike, but it hit over 50 miles an hour during it's track trial. EVolution: Not all of the interesting cars took to racing, from what I saw. 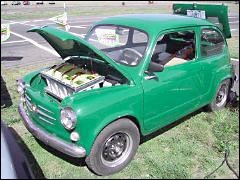 There was a great little green Fiat that was just for show. It's got 9 'gel cells' packed into it. The owner plans on cutting into the rear firewall and laying out the batteries flat. Also, there was a great electric powered, wind driven 'car' that took to the strip to find it's top speed of 25 miles an hour, if I recall. This thing was pretty cool, and caused a *lot* of buzz around the pits. Autocrossing: More buzz came from a bright yellow roadster took the track for a time or two. It took no prize, but it certainly turned some heads at the Autocross. The Autocross track is a test of a car's handing. The course at Woodburn started with a slalom, a tight left then right, a 270 degree corner, a short straight away, a couple more swerves then a right to bring the car back to the start. There was a converted Porche 914, with a dual motor drive! It made some great time on the autocross. The Finish Line: I can really see how people get into this. It's not my thing, I really don't have the patience to participate in this sport, but I can still appreciate the work, dedication and rewards that the participants feel. I'm mostly looking for information to build something that has a range of 300 miles. That's a lot of miles to put on a single charge, but it's a goal. Once I actually start to feel comfortable with these things, I might try to make this electric dream come true. Oh, and John Wayland? He and his Zombie (a converted Datsun) got beat by a Viper for the first time since the grudge match began 5 years ago. But they'll be back next year. I will too.